French mathematician, physicist and astronomer , who is often described as the last generalist in mathematics. Deviner avant de démontrer! Ai-je besoin de rappeler que c'est ainsi que se sont faites toutes les découvertes importantes. La valeur de la science. In Anton Bovier, Statistical Mechanics of Disordered Systems (2006), 218. Il faut bien s'arrêter quelque part, et pour que la science soit possible, il faut s'arrêter quand on a trouvé la simplicité. Analyse data just so far as to obtain simplicity and no further. La Science et L'Hypothèse (1902), 176. Sentence translated in A.D. Ritchie, Scientific Method: An Inquiry into the Character and Validy of Natural Law (1923), 201. Les faits ne parlent pas. Attributed. As quoted in Alan L. Mackay, The Harvest of a Quiet Eye. Les faits scientifiques, et à fortiori, les lois sont l’œuvre artificielle du savant ; la science ne peut donc rien nous apprendre de la vérité, elle ne peut nous servir que de règle d’action. The facts of science and, à fortiori, its laws are the artificial work of the scientist; science therefore can teach us nothing of the truth; it can only serve us as rule of action. In La Valeur de la Science (1904), 214, translated by George Bruce Halsted, in The Value of Science (1907), 112. Les principes sont des conventions et des définitions déguisés. Principles are conventions and definitions in disguise. From La Science et l’Hypothèse (1902), 165. Translation by George Bruce Halsted, Science and Hypothesis (New York, 1905), 100. In Science and Hypothesis (London 1905), 138. Longtemps les objets dont s'occupent les mathématiciens étaient our la pluspart mal définis; on croyait les connaître, parce qu'on se les représentatit avec le sens ou l'imagination; mais on n'en avait qu'une image grossière et non une idée précise sure laquelle le raisonment pût avoir prise. For a long time the objects that mathematicians dealt with were mostly ill-defined; one believed one knew them, but one represented them with the senses and imagination; but one had but a rough picture and not a precise idea on which reasoning could take hold. La valeur de la science. In Anton Bovier, Statistical Mechanics of Disordered Systems (2006), 97. All that we can hope from these inspirations, which are the fruits of unconscious work, is to obtain points of departure for such calculations. As for the calculations themselves, they must be made in the second period of conscious work which follows the inspiration, and in which the results of the inspiration are verified and the consequences deduced. Science and Method (1914, 2003), 62. Astronomy has not only taught us that there are laws, but that from these laws there is no escape, that with them there is no possible compromise. In Henri Poincaré and George Bruce Halsted (trans. ), The Value of Science: Essential Writings of Henri Poincare (1907), 86. By natural selection our mind has adapted itself to the conditions of the external world. It has adopted the geometry most advantageous to the species or, in other words, the most convenient. Geometry is not true, it is advantageous. Science and Hypothesis (1902), in The Foundations of Science: Science and Hypothesis, The Value of Science, Science and Method(1946), trans. by George Bruce Halsted, 91. Chance ... must be something more than the name we give to our ignorance. In Science and Method (1908) translated by Francis Maitland (1914, 2007), 66. Every good mathematician should also be a good chess player and vice versa. Science and Method (1914, 2003), 48. Science and Hypothesis (1902), trans. W. J. G. and preface by J. Larmor (1905), 140. Freedom is for science what the air is for an animal. Science and Method (1914, 2003), 117-118. Science and Method (1914, 2003), 25. If we work, it is less to obtain those positive results the common people think are our only interest, than to feel that aesthetic emotion and communicate it to those able to experience it. From the original French, “Si nous travaillons, c’est moins pour obtenir ces résultats auxquels le vulgaire nous croit uniquement attachés, que pour ressentir cette émotion esthétique et la communiquer à ceux qui sont capables de l’éprouver,” quoted in Henri Poincaré,'Notice sur Halphen', Journal de l’École Polytechnique (1890), 60, 143, cited in Oeuvres de G.H. Halphen (1916), Vol. 1, xxiv. As translated in Armand Borel, 'On the Place of Mathematics in Culture', in Armand Borel: Œvres: Collected Papers (1983), Vol. 4, 421. In Science and Method (1908) translated by Francis Maitland (1914, 2007), 129. In Science and Method (1952), 125. Henri Poincaré and George Bruce Halsted (trans.) The Foundations of Science: Science and Hypothesis (1921), 375. Newton has shown us that a law is only a necessary relation between the present state of the world and its immediately subsequent state. All the other laws since discovered are nothing else; they are in sum, differential equations. In Henri Poincaré and George Bruce Halsted (trans. 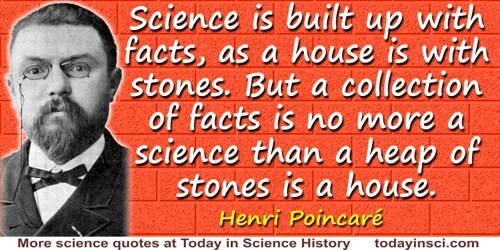 ), The Value of Science: Essential Writings of Henri Poincare (1907), 87. One does not ask whether a scientific theory is true, but only whether it is convenient. So is not mathematical analysis then not just a vain game of the mind? To the physicist it can only give a convenient language; but isn’t that a mediocre service, which after all we could have done without; and, it is not even to be feared that this artificial language be a veil, interposed between reality and the physicist’s eye? Far from that, without this language most of the intimate analogies of things would forever have remained unknown to us; and we would never have had knowledge of the internal harmony of the world, which is, as we shall see, the only true objective reality. From La valeur de la science. In Anton Bovier, Statistical Mechanics of Disordered Systems (2006), 3, giving translation "approximately" in the footnote of the opening epigraph in the original French: “L’analyse mathématique, n’est elle donc qu’un vain jeu d’esprit? Elle ne peut pas donner au physicien qu’un langage commode; n’est-ce pa là un médiocre service, dont on aurait pu se passer à la rigueur; et même n’est il pas à craindre que ce langage artificiel ne soit pas un voile interposé entre la réalité at l’oeil du physicien? Loin de là, sans ce langage, la pluspart des anaologies intimes des choses nous seraient demeurées à jamais inconnues; et nous aurions toujours ignoré l’harmonie interne du monde, qui est, nous le verrons, la seule véritable réalité objective.” Another translation, with a longer quote, beginning “Without this language…”, is on the Henri Poincaré Quotes" page of this website. The genesis of mathematical creation is a problem which should intensely interest the psychologist. In 'Mathematical Creation', The Value of Science, collected in Henri Poincaré and George bruce Halsted (trans. ), The Foundations of Science (1913), 383. The mind uses its faculty for creating only when experience forces it to do so. From La Science et l’Hypothèse (1908), 43 as translated by George Bruce Halsted in Science and Hypothesis (1905), 25. From the original French, “L’esprit n’use de sa faculté créatrice que quand l’expérience lui en impose la nécessité”. In Henri Poincaré and George Bruce Halsted (trans. ), The Value of Science: Essential Writings of Henri Poincare (1907), 85. When one talked with M. Hermite, he never evoked a sensuous image, and yet you soon perceived that the most abstract entities were for him like living beings. From La Valeur de la Science (1904), 32, as translated by George Bruce Halsted (trans. ), in The Value of Science (1907), 24. From the French, “Quand on causait avec M. Hermite; jamais il n’évoquait une image sensible, et pourtant vous vous aperceviez bientôt que les entités les plus abstraites étaient, pour lui comme des êtres vivants.” Also as epigraph, “Talk with M. Hermite. He never evokes a concrete image, yet you soon perceive that the more abstract entities are to him like living creatures”, in Eric Temple Bell, Men of Mathematics, (1937), 448. … it may happen that small differences in the initial conditions produce very great ones in the final phenomena. Science and Method (1908) translated by Francis Maitland (2003), 68. 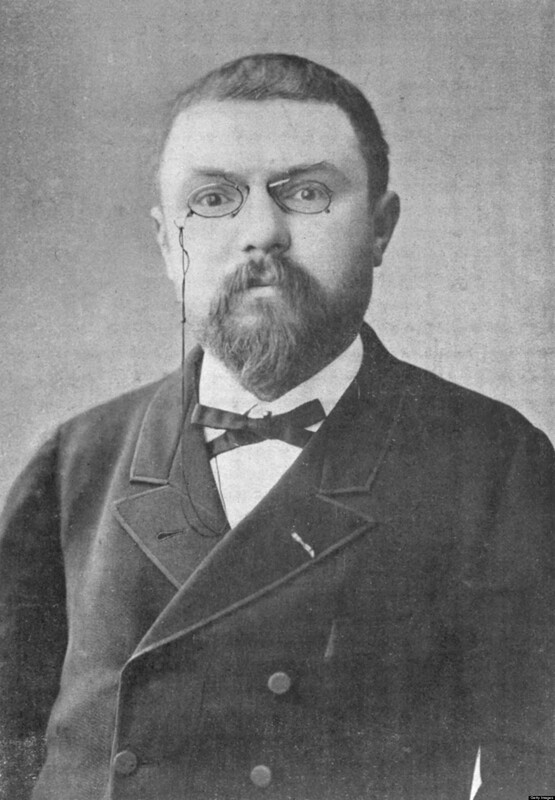 Poincaré was a vigorous opponent of the theory that all mathematics can be rewritten in terms of the most elementary notions of classical logic; something more than logic, he believed, makes mathematics what it is. In Men of Mathematics (1937), 552. 29 Apr - short biography, births, deaths and events on date of Poincaré's birth.